Greetings to the residents and famililies of Meridian Care. My/our purpose in healthcare ministry is to address the spiritual and social problems and needs of those in nursing homes and health care facilities. This purpose is carried out using Biblical - Faith principles. This principle is followed out in Matthew 9:36 as Jesus was teaching and healing among the people. “When He saw the crowds, he had compassion on them, because they were harassed and helpless like sheep with out a shepherd”. If Jesus walked among us today the passage might read; they were compulsive, addicted, disabled and sick with every disease. 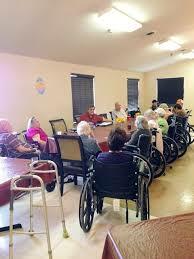 This is the way our society has become and in the nursing homes healthcare facilities about us this problem is great. In this ministry I and my team have considered this a ministry field. Just as Jesus said in Matthew 9:37 “The harvest is plentiful but the worker are few”. My personal aim is to go into this harvest field meeting the needs of our disabled world in the health care place among us. A laugh and a cry with each. Teaching and encouragement of the scripture. Small groups for Bible teaching & encouragement. Special song, scripture meditation for Dementia Alzheimer clients. Ministry to families of clients in resident care, Alzheimer care and those with ones in Hospice. After care visits for those in temporary care. We provide in-home visitation teaching and encouragement. Thanks And Hope to be a help to you in this health care facility. - Ronnie Talbert, His Servant and DFTL Program Director.